Modern kitchens come in all shapes, sizes and styles. Despite being grouped into one genre, modern kitchen styles are extremely diverse. Modern kitchen design is leaning towards smooth lines; solid bench countertops (such as stone); and, especially glossy cabinet doors, usually in the darker tones. Modern-Contemporary. Some types of words to describe this style of kitchen are minimalism and simplicity. It presents a streamlined appearance with little detail to reveal an uncluttered feeling. Modern-Classic. Although this is a modern space, it includes classic design principles to ensure that the kitchen remains timeless. Modern-Elegant. This type of kitchen primarily displays glossy cabinetry in order to showcase the new stainless steel aspects of today’s kitchen, such as the details and appliances. Modern-Traditional. 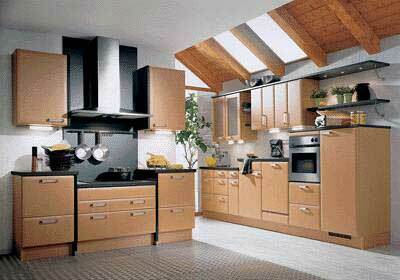 Is also another popular type of modern kitchen design. Here, despite the space looking and feeling modern, there are design aspects that are also at home in a conventional kitchen space. This type of kitchen is for homeowners who want a modern feel without an ultra modern space. In many homes, the kitchen is one of the most heavily used. As such, functionality is perhaps more important than appearance. Kitchens need to be carefully considered for aesthetics and practicality. The layout of a kitchen is very important. If possible, a triangle shape between the fridge, cooker and sink is desirable. Consider whether you really want a modern style of kitchen? It can present a different way of living, so homeowners are best advised to experience one prior to purchase. Even if an ultra modern kitchen is not for you, there are certainly aspects of modern kitchens that can be incorporated into your new kitchen. Modern kitchens come in an array of styles. Because kitchens are highly functional areas of the home, careful consideration is required prior to moving ahead. For expert advice and help on choosing your modern kitchen, the team at Custom Kitchens has you covered. Custom Kitchens will help you find that perfect fit when considering your next remodeling or kitchen renovation on the Outer banks.